After working as an assistant and then as an Osteopath for 6 years at the Peakhurst Sports Medicine Clinic, Sami started the Parramatta branch of the Sports Medicine Clinic in 2005. In 2001 he was the head physician for the Petersham Soccer Club, then from 2002-2004 he was the head physician for the Southern Star Sharks Soccer Club in the NSW State League. 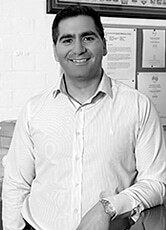 In 2005 Sami became the head physician for the St George Crows AFL Club in the NSW Premier League, and acts as a consultant till the present day. During his many years of practice Sami has had the opportunity to travel to Europe and work with elite athletes at the highest level. He is currently a consultant for the Barcelona Total Tennis Academy and Catania Football Club (FC) in the Italian Seria A. He was a guest lecturer at the University of Western Sydney Osteopathy program, registered with the NSW Osteopaths Registration Board and a member of the Australian Osteopathic Association. Copyright Sports Medicine Clinic (c) 2019.